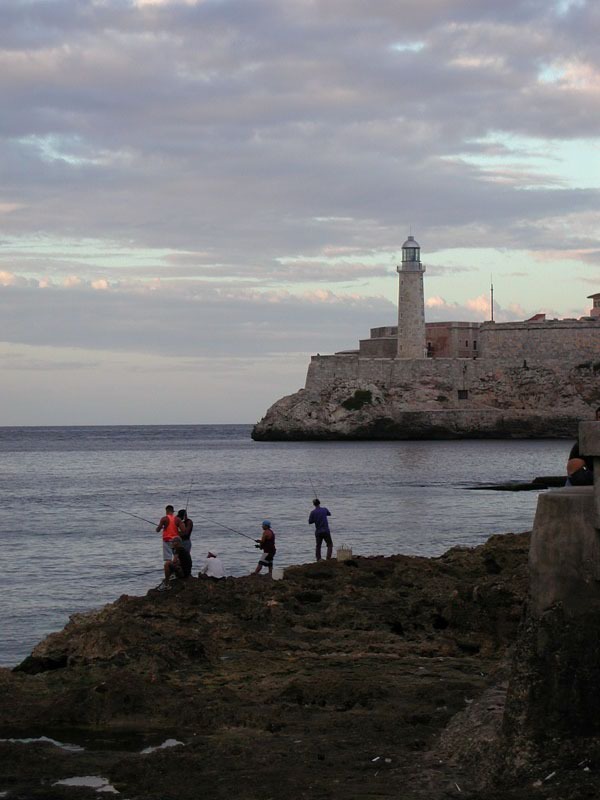 I wandered back to Old Havana where the city is the most scenic. 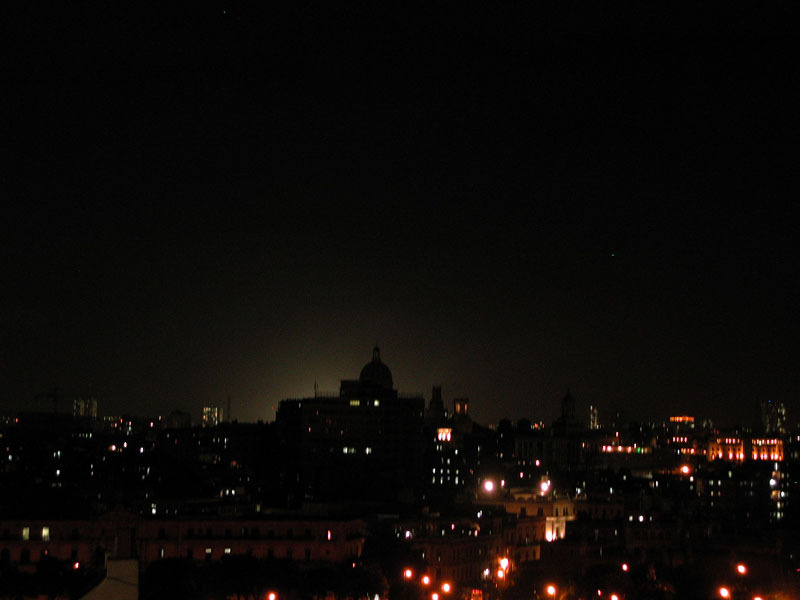 One of the highlights was the Camera Oscura -- "Dark Camera" -- which was a top one of the highest Old Havana towers. It's basically a pinhole camera that projects an image down from the top of the tower onto a large (about a meter in diameter) concave dish in a pitch-black room just below it. The camera rotates a full 180 degrees around the city and so what you get are these incredible panaramic views of the city. The thing that I found most incredible though was the realism. We are very used to video and even though we can't perceive still images flashing by at a high frame rate and our minds turn it into motion, it is not continuous motion. It's startling how much of a difference there still is! Looking at the image, you expect it to be something like video, but the quality was an order of magnitude higher and when you saw people moving or flags waving, it didn't look so much like an image but of a miniature. I was taken aback. I happened to run into the Guantanameras and another conference attendee (from California), Armin, just wandering around seeing the sights too. 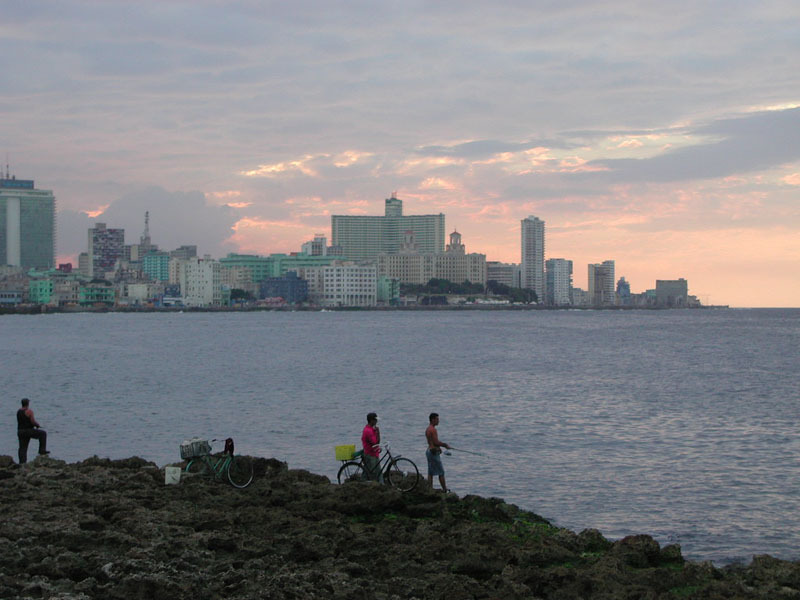 So we wandered up towards the Malecón -- the most famous street in Havana that borders the ocean -- and had a bite to eat. Turns out that November 27th is a Cuban Memorial Day of some sort -- I didn't quite catch the significance of it -- and there was a massive parade. 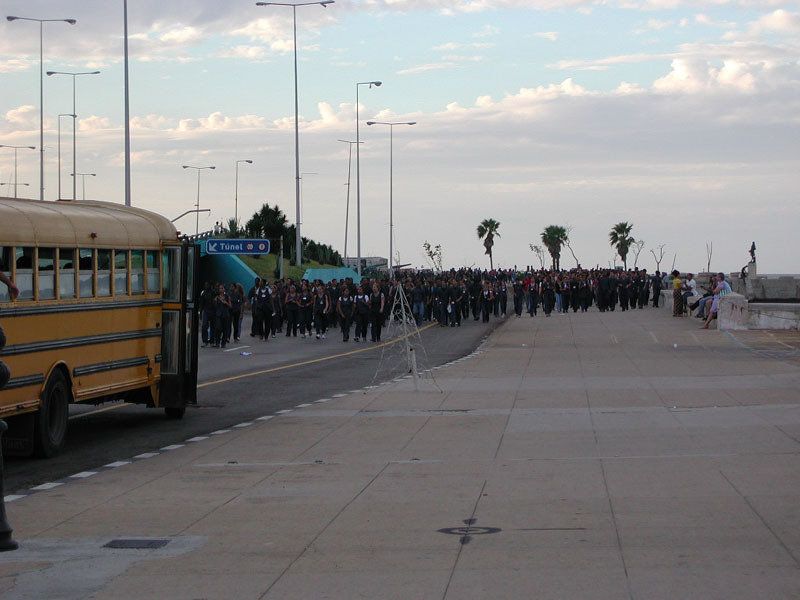 School children all around the area were bussed in to march in the event. It was not a parade of floats, but only of little-paper-flag-waving people. It made it quite difficult to get around for a while, but we did eventually escape. 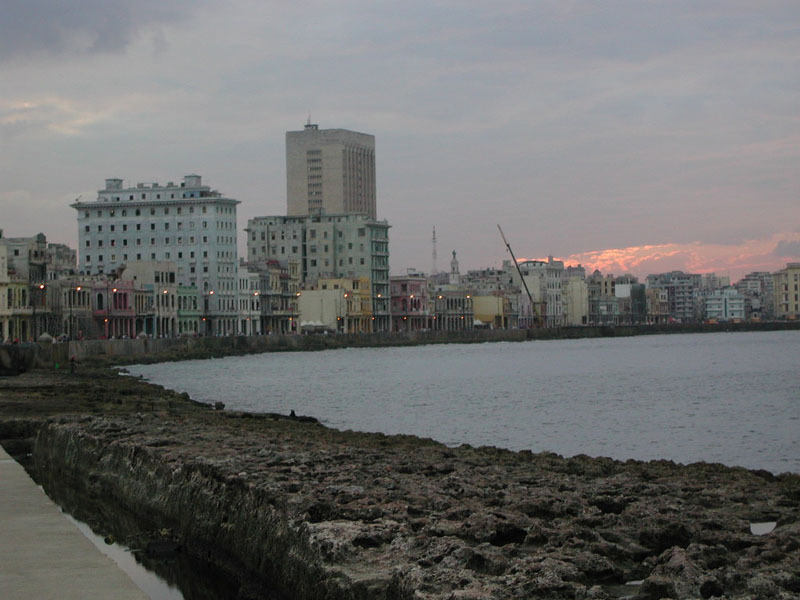 I parted company with the others who were getting tired, as I wanted to take a proper stroll along the Malecón and get some photos. It was the perfect time of day and the early evening light brought out some spectacular colours. There is an embankment wall protecting the street from the sea and during high tide, waves crash against it causing great plumes of water to shoot up fantastically -- better than any man-made water show. Of course, you have to be careful walking on that side of the street cause you could get soaked! When the tide is low, people crowd the rocks to fish. 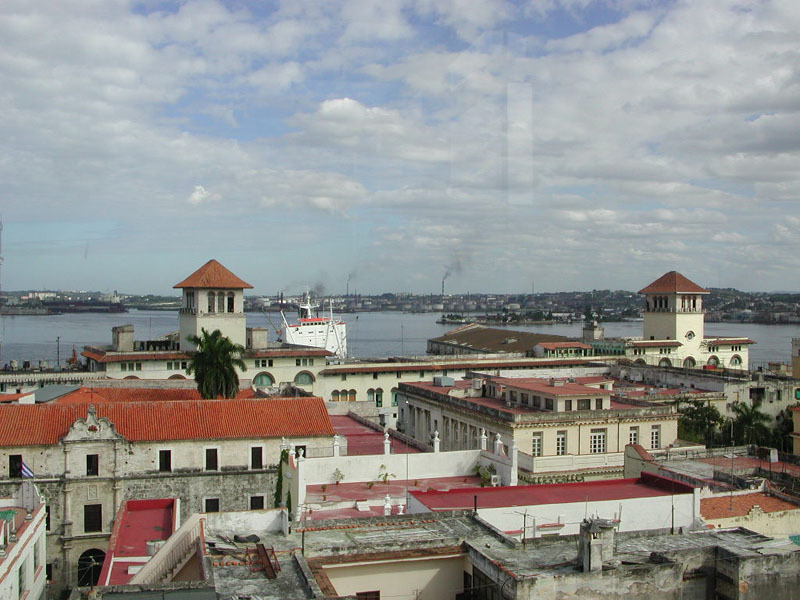 Most of the street borders open sea, but it makes a right angle turn into the mouth of the harbour and curls around Old Havana -- looking across the harbour from that end of the Malecón, you can see the two great fortresses on the hills of the opposite bank. 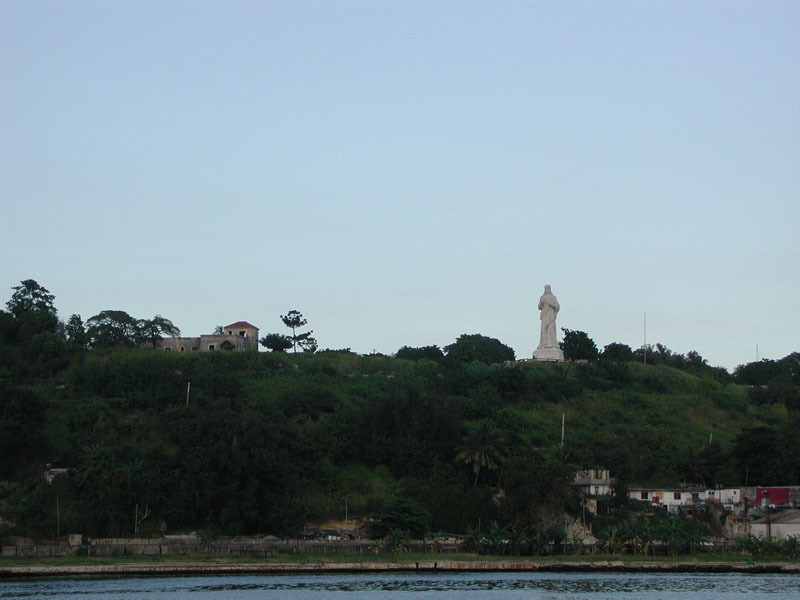 One, on the point with a lighthouse, the Castillo de los Tres Santos Reyes Magnos del Morro, was erected in the 16th century, and the larger of the two, the Fortaleza de San Carlos de la Cabaña, not until the 18th century. Oh, and who could forget about Jesus looking down over the harbour. Mike and I had prearranged to meet everyone later that evening at the large fortress for the nightly firing of a cannon. A hold over ritual from the old days when the shot would signal the closing of the city gates. Having been walking all day, I was in favour of catching a cab to take us through the tunnel under the harbour to the fortress, but Armin had told Mike that there was a ferry across that was cheaper so we decided to try it. 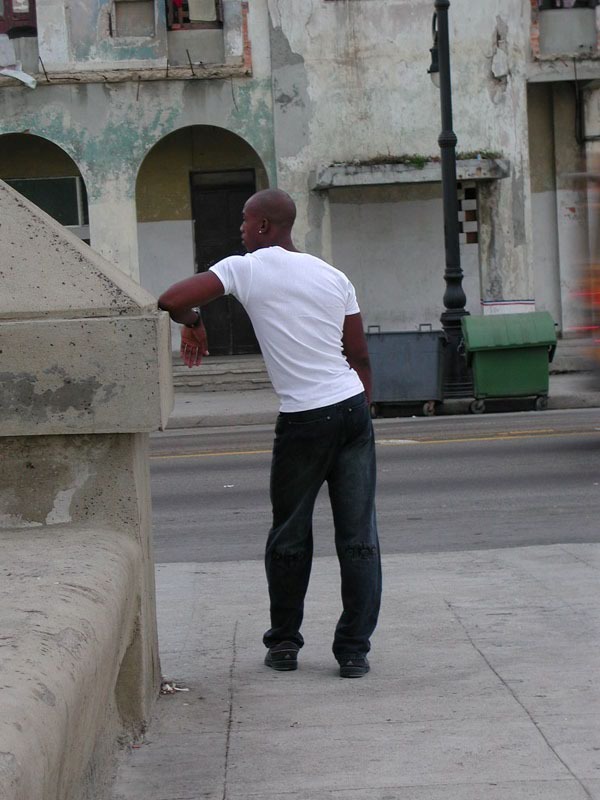 Armin's directions weren't so good though, and it turned out that the thing was way on the other end of Old Havana -- of course by the time we realized this, it was already too late and we had walked and walked and walked over there so we took it. As we were approaching the dock we noticed that ferry security was pretty tight and they were searching people's bags as they entered. "Of course" we realized -- just earlier that year a ferry had been hijacked and the hijackers executed (causing an uproar amongst human rights activists and Republicans in the US, who for once found a common cause). I leaned over to Mike and in a hesitant, whispered voice informed him: "I have the chicken". It's a long story how I came to be carrying a rubber chicken around Havana, but there it was in my bag. A large, uniformed, owly-looking woman snatched my bag away from me, plunged in her hand, and on the first try managed to get a hold of the chicken around its neck. She lofted it high in front of her to assess exactly what it was. She blinked at it a few times, uncomprehending -- really, there's no reason to expect that she's ever seen a rubber chicken before in her life. Then you could see a momentary attempt to keep her cool, but there was no containing it -- she burst into hysterical laughter as did the other guards and the line of people once they managed to get a good look at what she was holding. I turned pretty red myself. We ended up not having proper change for the ferry and had to give them a five (US) for which we didn't get any change back (they don't give change to stupid tourists often...), so the trip ended up costing us quite a lot more than the taxi would have in the first place. And then it didn't even drop us off any where near the fortress like we thought it was supposed to. We ended up on a dark, deserted road with only a vague idea of where we needed to go. (More walking!) I figured that as long as the road was going generally in the direction that we wanted it to, we might as well take it -- especially since no other solutions were presenting themselves, so I urged a hesitant Mike along. The cannon was loud. And the procession of period soldiers was largely ruined by flashes and one idiot tourist who thought it appropriate to use a head-mounted flood light so that he could video the whole thing. 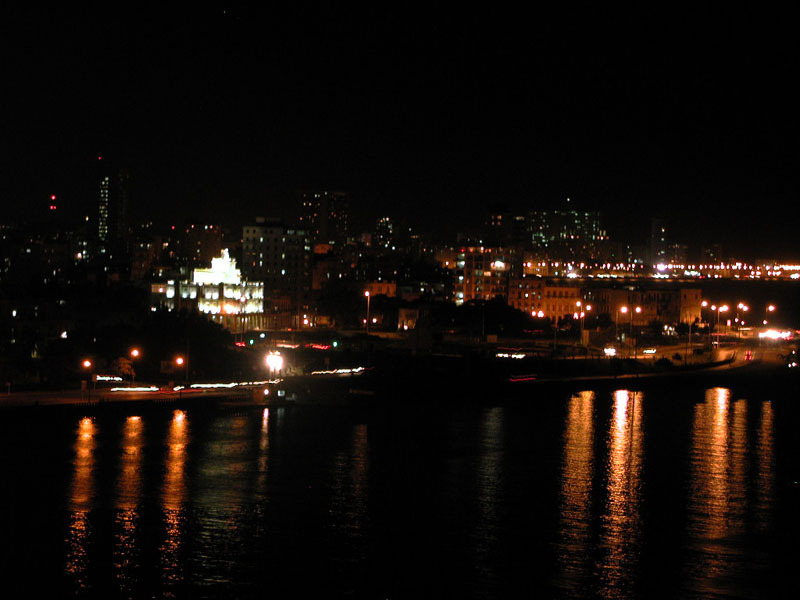 However, the fortress itself was pretty fun to explore and I managed to get some great night-shots of downtown. There was no objection when I suggested catching a cab back to the hotel.